This week we are trying something new with our latest ‘4 O’Clock Church’ service. 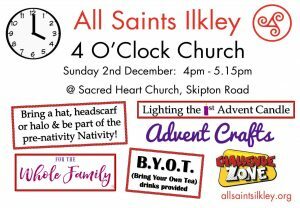 Join us at 4pm on Sunday 2nd December at the Church of the Sacred Heart, Stockeld Road where there will be fun, craft and a family friendly service. Bring your own picnic tea for afterwards and get to know us. All are welcome and we look forward to seeing you there!